Looking for something fun to do and the chance to win some Triple Crown Feed? 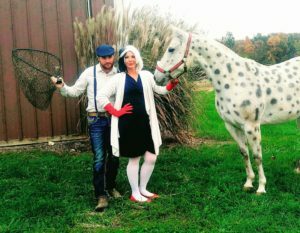 Triple Crown 7th Annual Halloween Costume Contest! The Submission period has ended!! Head to our Facebook page and view all the entries! “LIKE” your favorite photos to cast your vote! People’s Choice Winner-All entries will be placed into a Facebook album titled- “2018 Triple Crown Halloween Contest”, and we will begin a voting period from November 9th- November 19th. Facebook fans are encouraged to “like” their favorite entry. The photo with the most “likes” will win People’s Choice. Triple Crown Winner– The Triple Crown staff will select their favorite entry and announce a second winner. Each winner receives 3 free bag coupons and Triple Crown swag. Winners announced 11/20/2018 on our Facebook page!